Finally, one of my most sought-after movies. I’ve been looking for this since before I started writing this blog. Widely regarded as perhaps the worst movie ever, I heard of it as a hilarious movie everyone else was wrong about. I’ve been looking for a chance to find out for myself for the better part of a decade, but due to its extreme unpopularity, it’s been hard to find until now. Lyle and Chuck are terrible singers and mediocre songwriters trying to get their songs published as “Rogers and Clark”, with dreams of rivaling Simon and Garfunkel. When they finally get an agent, all he can book them for is a lounge act in a hotel in Morocco. While getting a transfer in neighboring Ishtar, Chuck is entreated by Shirra to let her use his passport and exchange suitcases so she can get to safety in Morocco, and he agrees, believing he can get another passport quickly. 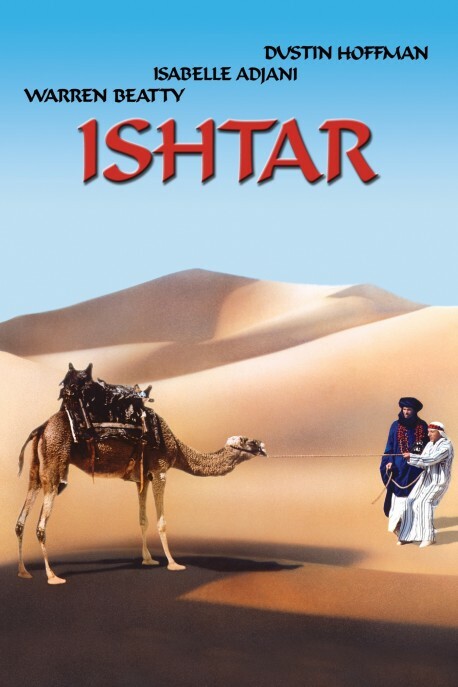 However, because of the turmoil in Ishtar, he ends up stuck in Ishtar until CIA agent Jim Harrison bales him out, telling him that Shirra is the top operative in the communist movement to overthrow the Emir of Ishtar. After Lyle and Chuck reunite, Lyle catches Shirra trying to get her bag back, and is persuaded to help her, and Shirra learns Chuck has been meeting with the CIA. So Lyle and Chuck each believe the other is working for the enemy and both the CIA and the rebels believe the duo to be a liability, all over a prophetic map that could give religious weight to this civil war. A lesson in managing expectations: when this movie premiered, it had immense star power and an infamously runaway budget, so audiences expected it to be solid gold. Many viewers since then have been told it was scraped off a producer’s shoe, and finding it so much better than that, venerated it to counter the hate. I heard both, the star power diminished (whatever happened to Warren Beatty? ), and tried to go in just on the attached blurb. So I saw an Ishtar that was a mixed mess. There’s quite a lot to enjoy here, but there are a lot of scenes that mainly lie flat and bore me to the point that I might not be as receptive to the stray jokes in them. And for that, I blame editing and oversight. It’s hard to point to what didn’t work, but I think it’s mainly pacing. It felt slow until the climax was engaged. This kind of multidirectional misunderstanding story works best with rapid-fire pacing, because if the characters hang around in the same place talking to each other forever, it becomes harder to justify why they don’t actually address their differences. And this story lingers everywhere. On a second watch, when I’m not waiting for the desert to show up, the length of the New York section (which has a lot of the funniest material) would probably be less troublesome, but then the rest meanders all over the place, with the best material being where the plot stops deadest. Aside from the pacing, I would have liked to have seen more presence from Shirra, who is almost as much a Macguffin as the map everyone thinks she has, but then so would have Beatty (if only to placate his girlfriend). The climactic firefight feels a bit limp, but it was cut short because it was the point where morale completely fell apart. The movie is at its most entertaining when Chuck and Lyle are together, but they have to be split up for long stretches in order to hold off on them talking their way back to the same side until the right moment. I really, really enjoyed the bad songs and terrible singing. I’m not entirely sure if I should have appreciated “Telling the truth is a dangerous business” as a serious song, but I think it works on a serious level in a way none of the others did, and I would have loved for the credits to have showcased a single version of the song as sung by good singers. Instead, it led into the credits in its worst-sung rendition, but them’s the jokes I suppose.